California Gov. 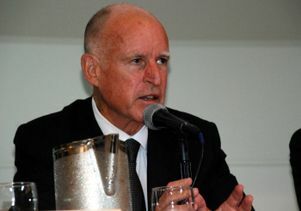 Jerry Brown kicked off a two-day conference at UCLA today, where politicians, business leaders, researchers and academics gathered to propose ways to meet Brown's goal of developing localized renewable energy sources that can produce 12,000 megawatts of power for the state by 2020. 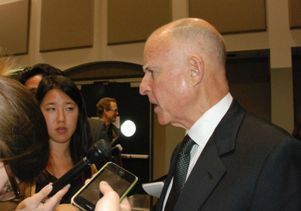 Brown focused heavily on solar power as the most likely and abundant source for the bulk of those 12,000 megawatts. "Whatever amount of oil they have over there in Texas, we have a hell of a lot more sun right here in California ... The sun is more abundant, more powerful and capable of generating more power," Brown said. "We are spending, we Americans, hundreds of billions of dollars on importing foreign oil that could all go back into our economy if we had domestic energy sources." Placing solar panels on the rooftops of homes and businesses would create decentralized power systems that would be harder to disrupt, Brown said. He joined a panel of solar-power supporters who highlighted feed-in tariff programs across the globe, which encourage homeowners and businesses to install rooftop solar panels that feed power to the city around them. 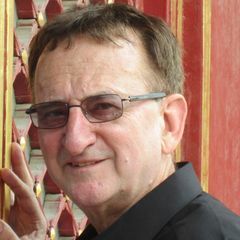 J.R. DeShazo, director of UCLA's Luskin Center for Innovation and an associate professor of public policy at the UCLA Luskin School of Public Affairs, who led another panel at the conference, helped develop a feed-in tariff system that forms the basis of Los Angeles' solar plan. "The governor's commitment to an event like this shows that he recognizes that he can play a leadership role in bringing together all of the pieces needed to make renewable energy possible," DeShazo said. "The event itself recognizes the need to get all the stakeholders at the table, come up with a plan and implement it. That hard work's going to start tomorrow, in all the panels, when we go through all of the challenges that renewable energy faces." Universities like UCLA have an important role in helping the state meet the 12,000 megawatt goal, Brown said. "Universities are ... training people who are vitally necessary, and then, of course, they can do things on their own rooftops," Brown said. "But I would say educating and research, that's plenty important, and then maybe some partnerships with private industry." The governor also expressed frustration with the limits of his power to move renewable resources forward. With distributed power, via solar panels on rooftops across the state, the breadth of the power supply is its strength, he noted, but he added that with 58 counties and more than 400 cities, each with their own rules and permits, the distribution is also one of the project's biggest challenges. "Our system of participation is such that any old fool can object to anything," Brown said. "Restricting participation is very difficult — it has the feel of [being] undemocratic. And yet, if you allow every person, however benighted, to play a role, you never get anything done. "[As mayor] in Oakland I learned that some opposition you have to crush. You can talk a little bit, but at the end of the day, you have to move forward. And California needs to move forward with renewable energy." For more news, visit UCLA Newsroom and UCLA News|Week and follow us on Twitter. Gov. 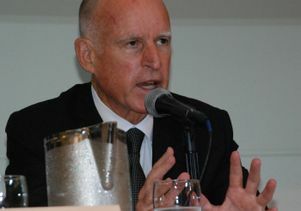 Jerry Brown speaking to reporters at "The Governor's Conference on Local Renewable Energy Resources," held at UCLA. Gov. 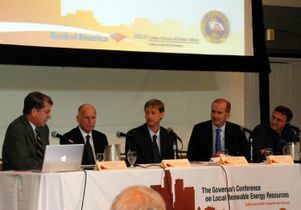 Jerry Brown addresses the crowd at "The Governor's Conference on Local Renewable Energy Resources" at UCLA. Gov. 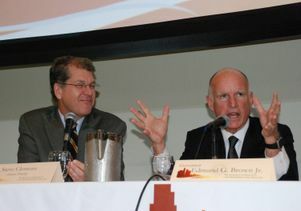 Jerry Brown addresses the crowd at the "Governor's Conference on Local Renewable Energy Resources" at UCLA.